Why is the joke invented unless to say the truth using it… There is such a saw in my country. So 2 years ago I joked with the idea of “negative interests”. Today it is no more a joke. It is a reality. The zombie politicians passed the “red line” established by centuries of economic history and by strong mind. 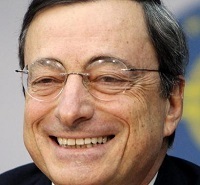 Yes – the European Central Bank decided to cut its deposit rate below zero. This looks like a ban for depositing money. Obviously no bank will hold money on deposit at ECB, as this will mean losing a share of it. It is logical banks will prefer to keep cash in vaults instead of depositing it. But how this will stimulate the economy? Money in vaults is the same as money in central bank. Neither of this means money is in business and consumers. Even up to now there were no money obstacles in front of financing the business. The record low interests were around for years. But no one wanted to borrow. So how exactly banks will press the business to borrow? The problem is not with money. All monetary experiments since 2008 showed that the problem is somewhere else. In fact it is in crushed real economy outsourced jobs and in the cut of the connection between being a worker and being a consumer. Now the West countries are only consumers that are producing nothing. The overall economic circulation is destroyed and the only that still keeps the system is money printing in West and accepting and accumulating this money in China. It is not clear till when China will be able to continue this. But it is clear that when the moment of truth comes, all the money-print will vanish in a hyperinflation fire. Yes, all this is a joke. But wasn’t it a joke the negative interest rate?